Thick, hearty polenta serves as the base for earthy, buttery mushrooms in this simple and quick recipe. Polenta, or "Italian grits," is perfectly cooked, salted, and buttered, so it's creamy and flavorful...probably good enough to eat on its own! What's even better is that it cooks up quickly (in under 10 minutes), as opposed to the more traditional polenta that can take an hour or more. The mushroom "sauce" consists of shallots and mushrooms sauteed in browned butter, then simmered with broth (I used vegetable instead of chicken), plus a little lemon juice for tanginess, chopped fresh chives, and cornstarch to thicken everything up. Unfortunately, the sauce didn't really thicken up like I thought it would; I added a little more cornstarch, but to no avail. 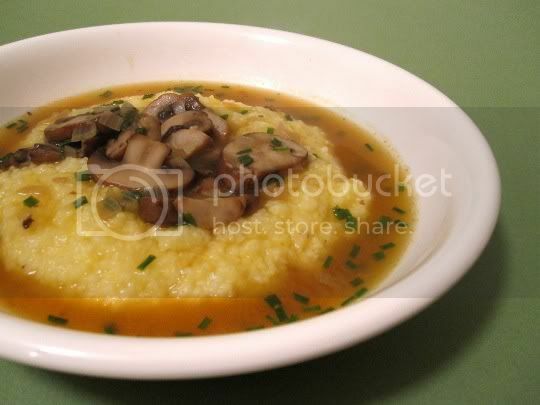 But it did make for an absolutely appetizing finished product (and great photo), as the sauce pooled around the polenta mound with the mushrooms settling on top. The polenta was salty and creamy, the mushrooms were earthy and robust, and the sauce was tangy and buttery. In fact, I think this was the first time I've had a mushroom and lemon combination; it was unique, but it worked! The only strange thing about this recipe was the serving size suggestion: one serving is VERY small, almost like a tiny appetizer or side dish portion. I doubled it up for a main dish, but I suppose you could serve it either way. Make again? Yes. Quick, easy, and tasty...and tres gourmet! I am unformiliar with buying polenta please help. What section is it in, in the store? Is it in tubes like cookie dough? Hi Nicole! Premade polenta is in tubes (like cookie dough), and is usually found in the pasta aisle near the sauces. Regular polenta (the kind you have to cook like grits), I've seen it in either the pasta aisle, cereal aisle (where you'd find Bob's Red Mill products), or even the baking aisle (usually with the cornmeal). If worst comes to worst, you probably could just use a coarse-ground grits.